GE 6.0 cu. 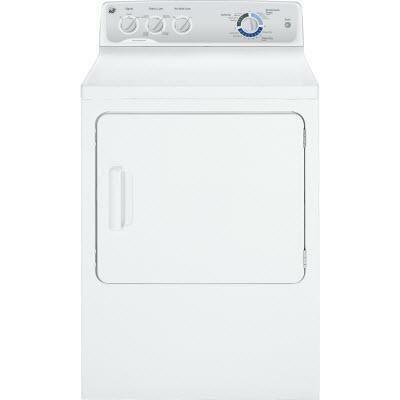 ft. capacity electric dryer with DuraDrum™ interior to provide long-lasting dependability. 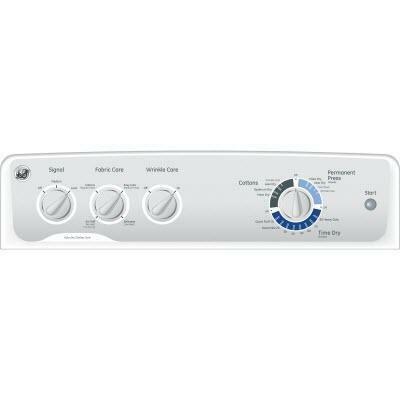 Featuring 4 heat selections that provide the right temperatures for your clothes-drying needs, Auto Dry that monitors air temperature to set dry times, Dewrinkle that reduces creasing and wrinkling, Quick Fluff™ that delivers ready-to-go results in minutes without heat and variable End-Of-Cycle signal with adjustable volume that offers added flexibility. Dry Cycles Cottons cycles: More dry, Optimum Dry, Less dry; Permanent Press cycles: More dry, Less dry; Quick Fluff cycle; Dewrinkle cycle; Heavy Duty cycle; Timed Dry. Dryness Levels Optimum Dry; More dry; Less dry. Additional Information Quiet Package: Quiet-By-Design™ Energy Star® Qualified: Control Type: Electromechanical Additional Cycles: Quick FluffDewrinkle Timed Dry: 80 MinutesQuick Fluff (no heat) Cottons Cycle: More DryOptimum DryLess DryCool Down Quick Fluff (no heat): Yes Easy Care Cycle: Permanent PressMore DryLess DryCool Down Drum Type: DuraDrum™ Exhaust Options: 4-Way (Rear; Right; Left & Bottom) Additional Dryer Features: Front ServiceableInterior LightRemovable Up-Front Lint Filter Dryer Control Features: End-of-Cycle Signal Volts/Watts/Amps: 240V,5600W,24A,60Hz or 208V,4400W,22A,60Hz . 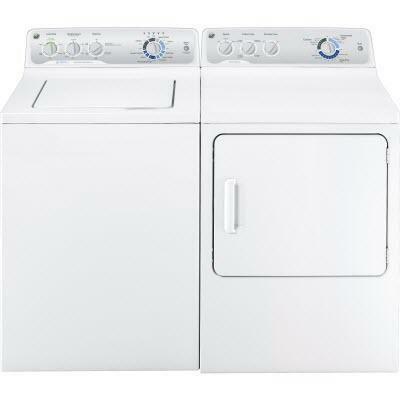 Warranty Labor Warranty: Limited 1-year entire appliance Parts Warranty: Limited 1-year entire appliance Warranty Notes: See written warranty for full details.